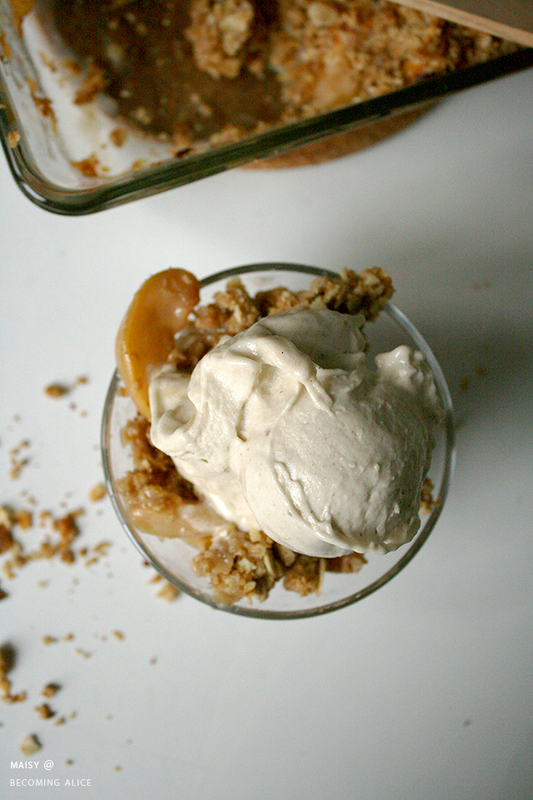 Apple crisp is one of those recipes that most people probably already have the ingredients on hand. Soft baked apples with the most delicious oat/crumb topping and perhaps a scoop of melting vanilla ice cream! What's not to love? 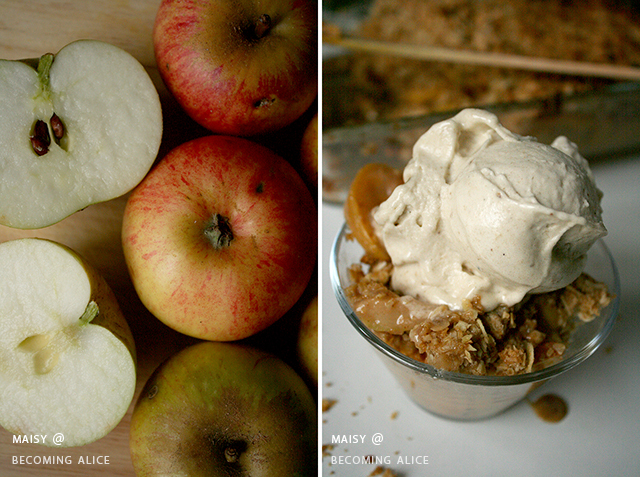 The variety of apples you use in apple crisp doesn't matter much; in fact, I prefer mixing my favourites to get the most robust, rounded flavour. However, what I do prefer and recommend is handpicked apples. You know those waxy specimens they sell at the grocery store? Ugh. There is nothing like an apple picked fresh off the tree! I was lucky enough to have my Mum drop off a bunch of apples that she picked at a friend's garden (thanks, Mum!). 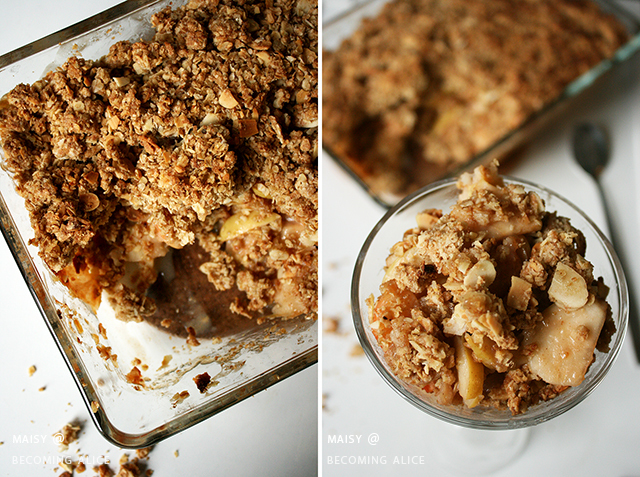 So the first thing that came to mind was, of course: Apple Crisp! Preheat oven to 350°F or 175°C. Wash and cut your apples into even slices. In a large mixing bowl, toss to coat with sugar, lemon juice, grated ginger, cinnamon and nutmeg. Add cornstarch and soy milk to a glass or bowl and stir to combine. Add to the apple slices and toss to combine. If you like, add 1 tsp of rum to the mix (the alcohol will evaporate during the baking process and only the flavour will remain). Spread apple filling in an ungreased 9x5 (or similar size) baking dish. In the same mixing bowl combine the crumb topping ingredients with a fork, your clean hands or a hand mixer until it resembles small crumbs. Sprinkle the streusel topping evenly over apples. Press lightly. Bake for 30-35 minutes or until apples are tender and the topping is golden brown. Remove from oven and allow to cool for at least 10 minutes before serving. Meanwhile, prepare the homemade vanilla ice cream if desired. While the crisp is cooling down slightly, chuck your frozen banana pieces into the blender and blend, blend, blend - pushing or scraping down the bananas when they stick to the side - until a gorgeously smooth and creamy mass forms. Add vanilla and blend again for a few seconds until incorporated. BTW: I did my homework and found out what the difference between a crumble, a crisp and a cobbler is! Hurray! > Crisp: fruit baked covered with a crispy streusel topping; the topping usually consists of butter, flour, oats, brown sugar and spices such as cinnamon and/or nutmeg. 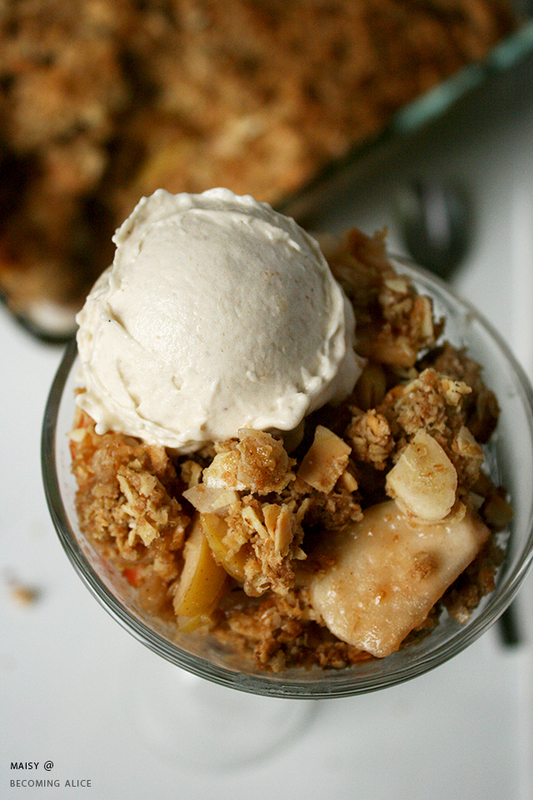 the most familiar type is apple crisp; other fruits such as cherries, pears, peaches, blueberries etc. can be used. > Cobbler: fruits baked covered with a crust formed of batter, biscuit or dumpling so it bakes up like a cobbled street; it is usually not made with oatmeal. common fillings include apple, blackberry, blueberry and peach. served with ice cream, cream, vanilla sauce or chocolate sauce. Now, I'd love to know: what are your favourite crisp combinations? Any other fruits you can recommend?! 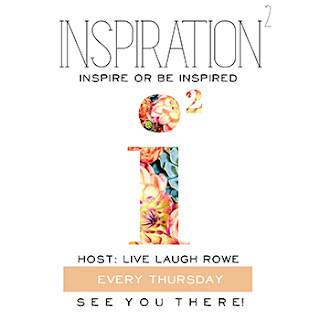 Thanks to Kelly over at Live Laugh Rowe for including me in her featured compilation of fall desserts and drinks!